Guys and gals, I took your advice on my last post and decided to move on from winter sewing to the fun stuff for spring. Therefore, I blame you for how cold I was taking these pictures in my open doorway. Just kidding... your encouragement helped this little dress come to fruition and I think it's wonderful. It's not denim, by the way; it's a $3 blue cotton bedsheet! Hey, wrinkly bum, this serves as a reminder to not sit down & play around on Pinterest before a photo shoot. The pattern is (mostly) Megan Nielsen's newest release - the Banksia Top, which she describes as a: "Semi-fitted [top] with button-up placket front and large peter pan collar... elbow-length sleeves and shaping darts at the bust line." In the back of the instruction booklet, Megan suggests some possible modifications to the top, such as lengthening the hem to make a dress. Well, that sounded brilliant, so I did it. Yes, that's black thread for the serged edges, tan thread for machine stitching, and white lining. Some of the seams have light blue thread, too, since that's what I started with before I switched to tan. Don't judge me for ugly mismatched garment interiors, please. Don't tell anyone but I left off the buttonholes; I just sewed the buttons through both layers of the placket because the neckline's low enough to pull the dress on over my head without having to unbutton it. So, why bother, amirite? I added a box with an X (an X-box?) to the bottom of the placket, mostly because I had messy placket sewing skills and I wanted to distract from the unevenness along the bottom seam. I highly recommend, if you make this pattern, to very carefully and evenly mark, cut and sew the placket lines. It makes a big difference in how neatly everything will fold and fit together at the bottom. Oh and another "design" element I added was narrowly tucked sleeve hems with double stitching. I lowered the bust darts and had them slant upward at a diagonal to the bust point. The original pattern has high horizontal darts, just like the Darling Ranges Dress, which I learned don't quite work for my shape. So I used my Lisette Traveler's Dress pattern as a guide, since those bust darts had better positioning. Hey! Looks familiar. I then knew mine would have to have brown buttons, too. By the way, Mary has a lovely "Sew Much Inspiration" pin board chock full of beautiful dresses to ogle - I recommend you follow her if you have a Pinterest account. 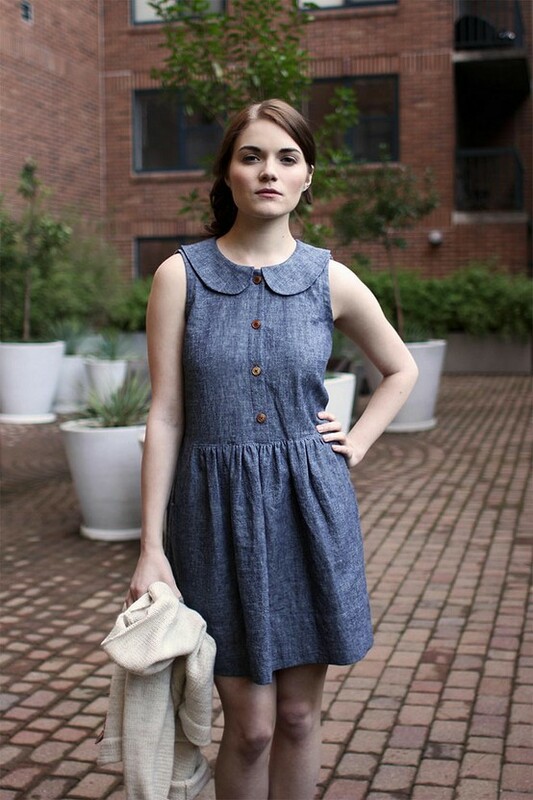 This dress is pretty cutesy with the collar, buttons and elastic. I won't lie, I feel kind of farmer's daughterish in it. "Well hi there folks!" Nothing wrong with that, though, and you never know when some hay-pitchin' opportunities will arise, so I best be dressed right. Is the Banksia Top (or dress!) in your sewing queue?